Today’s subject is a brief discussion about match pressure. If you shoot competition, you already know match pressure is real. So how can we control it? You dry fire frequently on a regular schedule. You exercise before live fire to get your heart rate up. You feel prepared to handle the match stress. However when you get to the starting box and the RO says “Shooter ready”, you get nervous, jittery and fall apart. Your heart rate quickens and your palms sweat. Unless you are a top shooter and/or have years (decades?) of experience under your belt, it will happen to you. So what are we to do? The reason is simple to diagnosis and hard to correct. You are over thinking and your conscious mind is tripping you up. Yes, the physical effects are caused by adrenaline and body alarm response but those are driven by your brain. You are your own worst enemy at the start of a stage. You work through different scenarios in your head; the “what ifs”, the good and bad from your last stage, how you are going to attack the stage and then you heard the magic words: “Load and make ready”. It is my hope that most of you will find nothing new about this phenomenon. If you are a member of the Brian Enos Forum (and you should be), then you are likely aware of Mr. Enos’ competition beliefs but he is not alone. USPSA Grand Master, Steve Anderson, has a wonderful podcast that is almost exclusively about the mental game. Let us not can’t forget Olympic Gold Medalist Lanny Bassham and his book, With Winning in Mind. Of course reading their works, their “Zen” if you will, won’t do much on its own. You need something to drive your focus when you are in the shooters box. Something you can take with you to both dry and live fire practice. What that “something” is will be up to the shooter. For instance, I focus on my breathing and try to listen to the surrounding noises and activity when awaiting the glorious sound of “Shooter ready – Standby”. If at an outdoor match, are there birds chirping? Are there leaves rustling? Try to focus on something that YOU can use to help calm the conscience mind. I will admit that this is not as easy to do as it is to talk about. When I manage it effectively, my speed and accuracy are at their peak; but when I fail to manage it, my times suffer and I make mistakes. Those mistakes are not a negative as long as you recognize each failure and learn from it. That is the key! Anyone can recognize they made an error but those who can use that recognition to learn will get better and ultimately quicker. You must never see your errors as a failure but as declaration of a weakness. An identification of where you need to practice. Ironically, this applies to life in general and not just shooting. Another thing a person can do, which I have used with success during the stage, is to view each shot as the only shot. “Issha Zetsumei” is a Japanese phrase that literally means “one shot and expire”. It points to the fact that each shot should stand alone. Do not worry about your score! Focus on the front sight. Press the trigger. Watch the front sight rise. Repeat. Don’t shoot faster than you can see, but at the same time, only see what you need to see. So there you have it. If you want to control match pressure you have to learn to control yourself. Shoot your game and let everything else go. The score will take care of itself based on your level of skill. Don’t shoot faster than your ability and don’t shoot slower than you need. Shoot your game, shoot at your level and have fun. And most important, remember to have fun. After all, it’s just a game. Student or Dry Fire Hero? I haven’t the talent to compete in USPSA at a championship level, but I have the patience to learn to shoot at my own skill level. 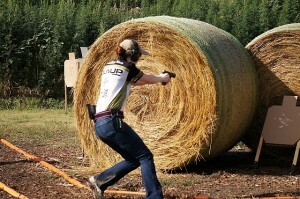 After learning the technical skills to shoot, it only remains to defeat your own anxiety. Breathing helps, but also removing the muscular tension which defeats your own goals. Before you assume the ‘ready position’, you can take a few seconds to do whatever it takes to loosen up.. Sometime you can just stand relaxed and rotate your shoulders, do some simple exercise such as “shaking it out” (wiggle your fingers, windmill your arms, shrug your shoulders). Upper-body Muscular tension will pull your shots off target because you’re trying too hard with your mind, and that angst translates itself to your musculature. This is especially apparent when your challenge is to stand in a box and engage a number of targets at various ranges and in several directions. 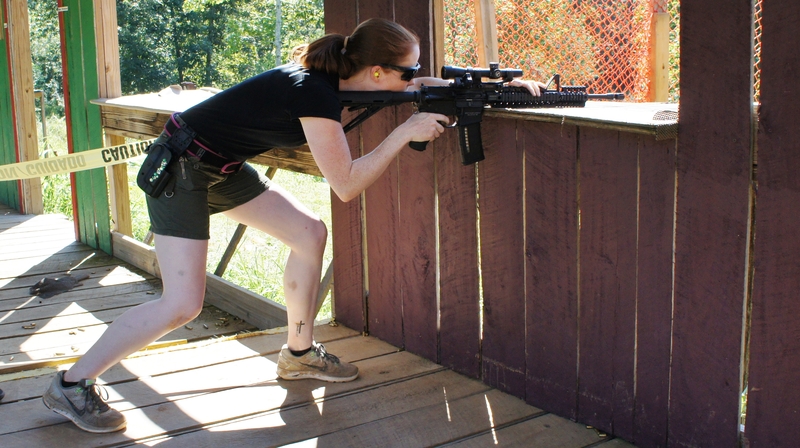 When you rotate your torso from the hips, using your bent knees to increase your angle of engagement, try not to engage targets at the far left or right by moving your arms (and bending your elbows). Instead, keep your shoulders perpendicular to the target line. Your arms should be extended at equal length. When you bend one elbow to aim at a target at the side, you are introducing tension in your shoulders. Your shoulders are the source of the muscular tension, which you need to avoid. If your upper body isn’t square with the target you’re engaging, your scores (and your time) will suffer. I have three carry guns. 38 detective, compact 9mm Glock, & 45 Ultra11Kimber, the later is my favorite. I use high quality waist holsters, that adequately conceal carry. I liked your articles on CCW.